Tribal conflict. Environmental desolation. Societal suffering. 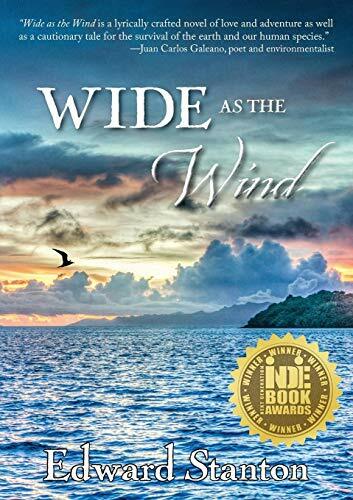 Based on ten years of Easter Island research, Edward Stanton’s novel “Wide as the Wind” tells the coming of age tale of two Polynesian siblings who embark on a dangerous journey to restore natural and cultural life and prosperity to their diminishing home island. This historical fiction novel provides a glimpse into a time of environmental distress due to war destruction and a loss of awareness towards the earth. “Wide as the Wind” takes place many years ago, yet it can speak to readers of all ages and backgrounds in a timeless way about the result of neglecting Earth’s natural environment. This novel is a unique voyage adventure and has an anthropological viewpoint, however, the text meanders in places, so be prepared to muscle through some verbose sections. Stanton introduces readers to the lifestyle of a society and their culture in an accessible approach by incorporating fictional characters and writing in a decidedly fiction-esque style. Unfortunately, the second half of this book felt slow in comparison to the beginning. Despite moments of tedium, Stanton’s “Wide as the Wind” is vividly tragic and dramatically rich. It’s a historical tale without feeling historical. Featuring themes of adventure, war, and a comparable Romeo and Juliet type romance, this novel is perfect for readers weary of history and anthropology but zealous for adventure and drama. It gives a glimpse into an ancient society through an adolescent perspective, which can be interesting to fellow history and anthropology enthusiasts. This book features content that may be too mature for some readers under the age of 12, such as some violence, graphic mentions of cannibalism, intense survival situations, and some mild sexual and pubertal references.